Drawing from recently obtained immigration court records, this is the fifth of five pieces describing how U.S. immigration agents turned a Canadian couple's vacation into a nightmarish trip through the labyrinth of immigration deportation proceedings. Part I here; part II is here (arrest in Sweetgrass, Montana); part three here (first immigration court hearing), and part four is here (second immigration court hearing). For entire series, click here and read from bottom up. 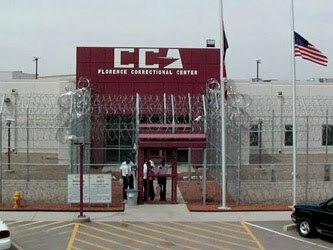 The image above is the Florence Correctional Center, run by the Corrections Corporation of America. Kenneth Danard was unlawfully held here from November 26, 2008 to January 20, 2009, wearing what he said his podmates in the custody of Immigration and Customs Enforcement (ICE) called "chicken yellow" jumpsuits . On December 29, 2008 Bruce Taylor, an adjudicator employed by the Executive Office of Immigration Review, an agency of the Department of Justice, issued an order that ICE release Mr. Danard under the terms of a voluntary departure. Mr. Danard's wife Rachel immediately purchased a plane ticket and provided the confirmation number to his deportation officer for the purpose of arranging a trip to the Phoenix airport and a direct flight to Edmonton as soon as possible. ICE ignored this information, and two subsequent notes from Mr. Danard pleading for a trip to the airport so he could leave his confinement, paid for of course by U.S. taxpayers. ICE records released to the Canadian government and then to the Danards show that on January 8 and January 9 Mr. Danard's deportation officer (the name appears to be Schlung), responded to Mr. Danard's queries about his departure by saying arrangements were being made and he would leave "soon." Under the terms of a "voluntary departure" a respondent agrees to leave the country at his own expense, usually a very expensive open ticket, so that ICE can arrange the trip to the airport at its own convenience. The incentive for this and not a "removal order" is that the latter not only imposes more stringent requirements for attempting to return but it also leaves one at the whim of the government-paid flights organized by the U.S. Marshals. By granting Mr. Danard voluntary departure the adjudicator was attempting to hold up his end of the coerced deal (see previous post) and allow a speedy return. Mr. Taylor, when he gave ICE until January 20 or "any extensions as may be granted by the District Director, Department of Homeland Security" envisioned this outside date as allowing Mr. Danard the maximum flexibility in obtaining his plane ticket--not purchasing a ticket by the stated date would violate the terms of the voluntary departure agreement and allow ICE to remove Mr. Danard on its own planes and with more stringent conditions for his return. ICE took advantage of the regulation's demonstrably unfounded assumption that ICE would not deliberately incarcerate at taxpayer expense someone who had the legal authority and means of leaving the country, and waited until January 20, three weeks after the hearing, before giving Mr. Danard his freedom. Last month I sent ICE's Ernestine Fobbs a few questions about Mr. Danard's case, along with a privacy waiver signed by Mr. Danard. I asked if it was consistent with agency policy for ICE attorneys to file a motion to reopen without evidence sufficient to overcome a termination order, and also whether it was consistent with ICE policy to hold people for several weeks after they had procured an order for voluntary departure and a plane ticket to their home country. requesting you can submit a FOIA request. The Freedom of Information Act covers only systems records, i.e., documents the government already has on file so to speak. The Public Affairs office is the appropriate office for reaching out to agency officials for answering policy questions. Ms. Fobbs did not reply nor did she respond to two phone messages requesting elaboration. Moreover, in early September Mr. Danard finally received his DHS file in response to his own FOIA request. It is a 118 pages. 109 pages are blacked out. The FOIA exemption cited was a law enforcement investigation. I recently noticed in correspondence forwarded to me by the Danards that in March, 2009 the Department of Homeland Security's Office for Civil Rights and Civil Liberties replied to the Danard's complaint about their treatment by stating that their letter was being forwarded to ICE's Office of Professional Responsibility (OPR), as this was the component appropriate for reviewing their concerns. The letter stating the matter was forwarded to the OPR would be seen by the FOIA office folks who would immediately flag that as a reason not to release the file, even if there was no actual investigation. The DHS's abuse of the FOIA exemptions is not a situation unique to the Danards. In the case of Mark Lyttle, a North Carolina native who speaks no Spanish and whom ICE deported to Mexico, ICE refuses to respond to a FOIA request for his own hand-written grievances written while he was unlawfully locked up in the Stewart Detention Center in Lumpkin, Georgia. The office did confirm that he submitted eight grievances totaling 20 pages between November and December, 2008. Mr. Danard writes, "John Lennon summed it up when he said our leaders are all insane." Many of Mr. Danard's problems occurred because bad laws authorized a context for empowering ICE and border patrol agents to think they could behave unlawfully as well. For instance, a law that authorizes the government to keep people locked up WITH NO REGULATIONS governing their treatment is going to empower the people running these places to feel authorized to do anything at all, as is a law that allows the government to lock up foreigners without assigning them legal counsel. Likewise, a law whose purpose is to give special privileges to Canadians needs to be rewritten when its effect is to deprive them of their liberty, and the same for the voluntary departure regulations. 1) The Border Patrol agents in Canada deliberately provided false and misleading information on the charging document--they only had legal grounds for charging him with being inadmissible at their own port of Sweetgrass, Montana, and not El Paso, the port indicated on the Notice to Appear. Instead, knowing that Mr. Danard had left the U.S. and therefore requiring him to apply to re-enter from Canada, and knowing that he never entered El Paso as a B-1 visitor, these agents deliberately omitted crucial information that would exonerate him and stated false information consistent with immigration violations that were the basis of a false arrest. DHS components have the authority to hold someone who is inadmissible at the border, but DHS components do not have the authority to do so under false pretenses and deny those in their custody due process rights, most importantly the right to know why one is being held. It is one more black mark on the immigration courts in ICE jails that not one but two adjudicators, including Bruce Taylor, who made a big show of Mr. Danard's "rights advisals" at the beginning of the hearing, failed to ascertain that through the course of two hearings, and eventually his entire time in ICE custody, Mr. Danard had never received a copy of his charges. ICE agents know these are systemic failures and rely on the incompetence of the adjudicators to cover-up their document fraud. 3. ICE is abusing the FOIA exemptions for law enforcement investigations, not surprising in light of the darkness advocated by the White House and Attorney General more generally. Finally, the Danards are furious at their own government as well, for not pressing harder on the U.S. to assist in Mr. Danard's release. However, Canada has its own border policies and is upsetting U.S. citizens who, for instance, are refused admission because of drunk driving records--one of the few countries to make this grounds for inadmissibility--or for left media affiliations. Canada makes mistakes and holds people at their own ports for hours and even longer, posing significant hurdles to travel that perhaps gives the Canadian government pause when it comes to questioning the egregious practices of its neighbor. Mr. Danard writes, "As to all this immigration nonsense, it bothered me watching my European counterparts deporting so many folks whose ancestral roots were at least American, be it north, central or south. Most of us are immigrants. I raised three Ojibwa step-sons. Maybe one day they will deport us back to Europe." Those of you who read this blog will be familiar with the fact-pattern of Immigration and Customs Enforcement and the Border Patrol's deportation of Luis Alberto Delgado, a U.S. citizen. On Sunday, CNN's Don Lemon interviewed Mr. Delgado, his attorney Isais Torres, and myself about this event. In re-reading the coverage in preparation I realized that Mr. Delgado was not the only U.S. citizen whose civil rights were violated, something I didn't mention on CNN but that bears notice. In addition, his brother, Eduardo Luis Pompa, who was driving, also was unlawfully arrested on the basis of racial profiling. The officer admitted that he used the pretext of driving without a license to arrest Mr. Delgado's brother who was then released after his U.S. citizenship was confirmed. Of course most U.S. citizens caught driving without a license receive a ticket and their car is impounded, but here Capt. Joe R. Martinez, who pulled the car over because Mr. Delgado was not wearing a seat belt, appears to have been using a traffic offense as an excuse to hold people, just in case they might be deportable. This is precisely the sort of civil rights violation that the Department of Justice (DOJ) alleged in its brief against the State of Arizona and its efforts to use law enforcement to verify legal status. The DOJ doesn't need to be worried about what may happen down the line but might want to consider filing federal civil rights suits against the localities where this is happening right now. The image above is the Canadian Consulate in Los Angeles, where Mr. Danard's own government unsuccessfully attempted to intercede and obtain his freedom. On December 8, 2008, Mr. Danard won, ICE lost, and hence Mr. Danard was hoping to fly home immediately. However, unlike real judicial proceedings in this country, if the government loses its case in an immigration court it has 30 days to decide on whether it will appeal the decision. After it files the appeal, it will take several months, and some cases more than a year, for the Board of Immigration Appeals to rule on the matter. Pending the final decision, a respondent whom the government is alleging is deportable because of criminal convictions must await the outcome behind bars. The result is that even when ICE loses the case on its merits, it has the legal leverage to force respondents into falsely confessing to the government's charges purely to avoid further delays in their release. In most cases, this coercion occurs with people who would like to remain in the United States, and hence there is a substantive good at stake--a non-citizen's right to U.S. residence--that gives these appeals some appearance of legitimacy. In Mr. Danard's case, the record described below, including a signed form delivered to his deportation officer the day he arrived in Florence, Arizona, shows that ICE deportation officers and attorneys knew that he wanted to leave the United States, and yet nonetheless sought to prolong proceedings for only one purpose: achieving an ICE "win" at the expense of actually allowing him to leave the United States at the earliest point possible. On December 11, 2008, Robert Bartlemay, Sr., on behalf of the Department of Homeland Security, filed a Motion to Reopen Mr. Danard's case. The motion contains numerous errors of fact revealing evidence of the DHS effort to run roughshod, and quickly at that, over Mr. Danard's rights, including the first sentence stating that Mr. Danard (his full name appears as the respondent) was in removal proceedings "under the name Guillermo G....." (last name omitted to protect someone else's privacy). The DHS needed to invent this motive of a car purchase because it would justify the fabricated statement on the NTA that Mr. Danard was in removal proceedings for violating conditions of a B-1 visa, a visa issued for business purposes. However, Mr. Danard never had a B-1 visa, nor did the government show otherwise. Instead, the U.S. government created a story and, the day of Mr. Danard's arrest, lied to officials from the Canadian Consulate and claimed that he "knew he wasn't supposed to enter the US because he told officers that the was aware of this, but thought he would gamble anyway." In the margins, Mr. Danard has written, "These statements are completely false. Never would have risked going to gaol in your country." Crucially, the DHS Motion to Reopen never offered new facts to challenge the initial decision's conclusion that the 1984 Burglary was NOT a Crime Involving Moral Turpitude. With no legal opinion supporting this charge, the government had no evidence for excluding Mr. Danard and ICE had no excuse for continuing to hold him in its jails. Therefore, while the Motion might be relevant for the adjudicator's continuing legal education, it had no bearing on the government's legal authority to keep Mr. Danard locked up. At this point Mr. Danard had been in touch with Katie Ruhl, an attorney at the Florence Immigration and Refugee Rights Project, a Legal Orientation Program in the area that provides limited legal advice and assistance to individuals in addition to its "Know Your Rights" presentations. According to email traffic from the Canadian Consulate in Los Angeles, who had been hearing from Rachel Danard and were trying for weeks without success to reach an ICE deportation officer, Ms. Ruhl had been in touch with Mr. Bartlemay, the DHS attorney, and obtained his agreement to drop the appeal and use the Motion to Reopen as an occasion for procuring Mr. Danard's release IF Mr. Danard stipulated that his 1984 burglary conviction was a Crime Involving Moral Turpitude. This may look like a standard plea deal like those struck in criminal courts every day, but this deal was being offered AFTER an adjudicator had ruled against the legal conclusion forwarded by the DHS. In other words, the DHS knew that during the first hearing the immigration judge had thrown out their theory that Mr. Danard had committed a CIMT, and they knew that the immigration judge had ruled against allowing them an extension to pursue a fishing expedition to find something that might disprove his conclusions, and yet nonetheless went ahead and forced Mr. Danard into a hearing at which his only option for release from his unlawful confinement was agreeing to a statement that a Department of Justice official was on record as holding was untrue. The second hearing was on December 29, 2008, over a month after Mr. Danard was kidnapped, and occurred before adjudicator Bruce Taylor, again in the Florence Service Processing Center, an ICE jail where, with other respondents, Mr. Danard had stood in a small room for hours before appearing in court. Before arriving at the hearing, there had been several phone calls among officers at the Canadian Consulate, including those reflecting telephone conversations with DHS officers, although it was not until December 18, almost a month after Mr. Danard was in ICE custody that consular officer Marie Dextraze was able to actually reach a deportation officer in Arizona. She wrote to her colleagues that the officer had spoken "with the lawyers (did not elaborate, but likely the prosecutor) who would like for them to obtain copies of subject previous convictions in Canada. Officer [blank] asked if this is something we can assist with." This further proves that ICE was trying to deport Mr. Danard based on evidence that it did not possess, and that the agency was unwilling to heed the Canadian government's request to simply allow Mr. Danard to leave, rather than holding him and forcing him to leave. advised that she had spoke with the subject's prosecutor, Mr. Bartlemay, who would be willing to allow the subject to apply for voluntary departure. She explained that they were preparing a letter to the judge, who is absent until Dec. 29th, who would then reconsider then case, then make a ruling, [and] if all parties agree with voluntary departure travel arrangements would need to be made. This process would be much quicker than appeal which could take 4 to 6 months. She could not say why lawyers would be requesting info on subject's previous convictions other than to bolster their case for inadmissibility into the US. Mr. Danard says, "To me it was extortion, and that's how it played out in the next hearing. If I admitted I was removable I would be cleared for voluntary deportation. If I wouldn't admit that, I would have to come back February 2d to prove why my crime in Canada was petty." The second hearing opens, as did the first, with Mr. Danard saying, "I'm just looking for a way back to Canada. I'm a tourist, not an immigrant." After swearing in Mr. Danard, the adjudicator, Mr. Taylor, asks if he was admitted into El Paso as a B-1 visitor. Mr. Danard, who still has not seen the charging document on which Mr. Taylor is relying, never answers the question and the adjudicator never bothers to look for government documents that might prove this allegation. (Again, none exist.) Crucially, once again, Mr. Taylor never bothers to check for Mr. Danard's signature on his Notice To Appear nor inquire if he received this. The adjudicator, Mr. Taylor, asks the government if it has the conviction records, and the woman presenting the case for the DHS -- her identity is not provided -- says, "No, your honor." In other words, rather than spend its time securing proof that Mr. Danard was convicted of a CIMT, the government used its resources to pressure Mr. Danard into conceding this, hence obviating the need for evidence. Mr. Taylor then pushes Mr. Danard to concede that he really was convicted of a CIMT. Mr. Danard had reason to believe that the description Mr. Taylor was giving him for a CIMT, "evidence of entry or remaining on the premises in a building or structure with intent to commit a theft," did not fit the circumstances of his own conviction, and when he hedged on agreeing he was convicted of a CIMT Mr. Taylor added, "If you want to contest your removability then we can set it for another hearing probably for February 2 or 3, and the government would have to get copies of your conviction records." Why threaten this additional extension? This was the hearing scheduled following the court's acceptance of the DHS Motion to Reopen. If the government had no evidence to support the charges in the NTA, then why not do what Mr. Bartolomei did and simply terminate the proceedings, again? There are three reasons the adjudicator may have had for doing this. First, most immigration judges come out of law enforcement backgrounds, including ICE, and are deferential to those holding these positions. Second, many also are are nervous that they might be throwing out a case for lack of evidence and then the respondent, on release, commits a horrible crime and the media blames the adjudicator. (In fact, this actually happened to Mr. Taylor two years later.) Third, immigration judges know that if they rule against the government instead of rescheduling, then the government will file an appeal, a process that will take months, and hence actually result in the unfair confinement of a respondent for a period longer than than if they reschedule. Now that 50% of all immigration cases involve people who are locked up, the regulations fixing these parameters need to be revisited. Again, there is nothing about Mr. Danard's hearing that is unusual. But only rarely is the government's ability to abuse its regulatory discretion so clearly revealed. Eventually, after Mr. Taylor asks Mr. Danard for the third time if he agrees that his conviction meets the conditions for a CIMT, Mr. Danard says, "I have no contest with the removal proceedings. I have no fight left in me." A few minutes later the government agrees to allow Mr. Danard to buy a ticket and leave as soon as the appropriate information is shared with his deportation officer, and Mr. Taylor suggests that Mr. Danard will be out soon. Mr. Taylor never hints that even though everyone had agreed Mr. Danard should be home, it would be three more weeks until this happened. Final post tomorrow on how ICE held Mr. Danard for three weeks AFTER he purchased an open ticket to Canada, and the Danard's dissatisfaction with their own government's efforts on their behalf. Drawing from recently obtained immigration court records, this is the third of five pieces describing how U.S. immigration agents turned a Canadian couple's vacation into a nightmarish trip through the labyrinth of immigration deportation proceedings. Part I here; part II is here. For entire series, click here and read from bottom up. 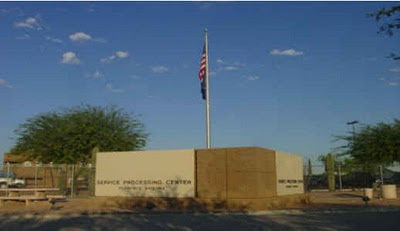 On December 8, 2008, Kenneth Murray Danard, a Canadian falsely arrested by Border Patrol agents at the Sweetgrass, Montana Port and then kidnapped by Immigration and Customs Enforcement (ICE) agents on November 20, was taken to an immigration court inside an ICE jail in Florence, Arizona, the Florence Processing Center (FPC). ICE was jailing a tourist who just wanted to go back to Canada so that the U.S. could deport him to Canada because, ICE alleged in a secret charging document, Mr. Danard's 1984 burglary was a Crime Involving Moral Turpitude (CIMT) and rendered him ineligible to enter the U.S. on a B-1 visa at El Paso, an event that never occurred and that the government never bothered to try to prove. The conditions under which the Executive Office of Immigration Review (EOIR) holds its hearings are an abomination to the concept of due process. By the time people held in the vast network of immigration prisons proximate to immigration courts in ICE facilities appear before an adjudicator, they have been standing since the wee hours of the morning in cramped rooms with no diversions or any other attention to their physical comfort. If the conditions of life in the ICE jails were itself not grounds for abandoning their legal right to remain in the United States, the periods of waiting to see the adjudicators are one more reminder of ICE cruelty and the respondents' humiliation. at 4 a.m. they put you in a little room for hour after hour until they bring you in [to the hearing]. It's right in the immigration facility, a cell holding 25 people, standing room only. They put you through torture. We were there three hours and then people go to court room. After their hearings the respondents are returned to the cell, the day interrupted only for lunch, consumed while standing in the same room. At 4:30 in the afternoon, they are brought back to their jail cells. Watching people who have obvious legal status agreeing to be deported is tough--young men who have lived here since infancy cannot bear these conditions--and it is clear from their sometimes impassioned speeches that that the conditions of the hearings as well as the ICE jails are coercing false confessions to manufactured ICE charges, as eventually happened in Mr. Danard's case. 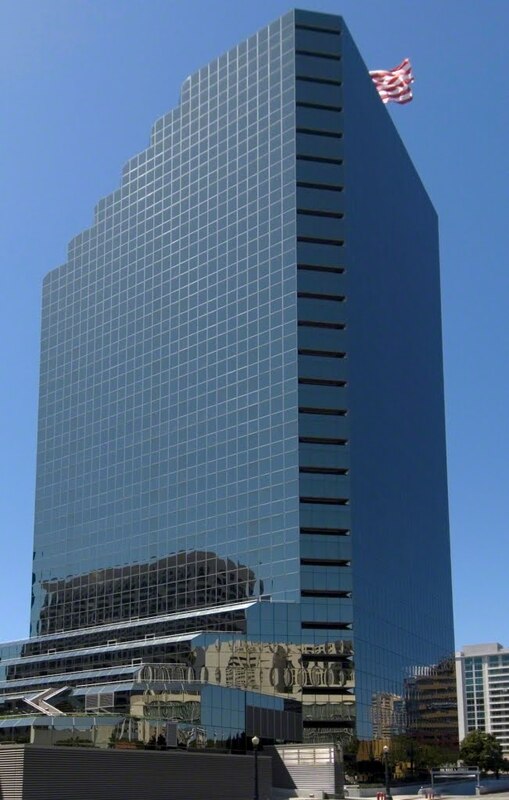 For Mr. Danard's first hearing the immigration judge, Richard Bartolomei, was in the building shown below, in San Diego, and the proceedings occurred via a televideo set up. Although Mr. Bartolomei possessed a copy of the NTA without Mr. Danard's signature, at no point did Mr. Bartolomei ask Mr. Danard if he had seen the charging documents. I had no idea what I was being held for. The guards claimed they had no access to my file, but that I wore a blue wrist-band ID meant I was not being criminally charged with a crime. I was surprised when Bartolomei said I had been charged with being illegally in the US, at the beginning of the hearing. In the event, Mr. Danard's hearing opens with him saying, "To me, the most important thing is to get back to Canada," and provides a fascinating look at the nuts and bolts of what happens when an immigration judge follows the rules and ICE does not. Mr. Bartolomei asked the ICE attorney if she had copies of Mr. Danard's convictions and could prove they were Crimes Involving Moral Turpitude. She did not have the convictions and she could not prove this. Mr. Bartolomei also ruled, incorrectly as it turns out, that Canada is a "visa waiver country" and this was another grounds for terminating the deportation order. Bartolomei: "What does the government want me to do, seeing that this gentleman wants to go back to Canada just as soon as possible?" Mr. Bartolomei: "I am terminating today based on the fact that these are visa waiver countries and that he is subject to the petty offense exception. You can certainly reserve appeal." Mr. Danard then says, "The most important thing to me is to return to my family. I'd like to go home tonight if it's possible." Mr. Bartolomei issues his decision orally and confirms this with a written order consistent with his statements during the hearing. At this point, ICE has lost a case that it never should have brought in the first place. But rather than release Mr. Danard, ICE continues Mr. Danard's torture by reserving the right to appeal Mr. Bartolomei's order. More to come, on the second hearing, ICE's extortionist efforts to abuse the appeal process through its Motion to Reopen, and ICE's current statement about this case. Drawing from recently obtained immigration court records, this is the second of five pieces describing how U.S. immigration agents turned a Canadian couple's vacation into a nightmarish trip through the labyrinth of immigration deportation proceedings. To read Part I, click here. The photo shows Murray Danard, a field machinist, in his shop in Alberta. "It's a small town and knowledge of my arrest has been damaging to my business," Mr. Danard said. On November 20, 2008, Kenneth Murray Danard, who lives in Whitecourt outside Edmonton, Canada with his wife, Rachel, was unlawfully locked up in the Sweetgrass, Montana Border Patrol office based on trumped up charges and then held in solitary confinement for two days at the Shelby Jail in Montana under the authority of the Department of Homeland Security (DHS). Then he was shipped to a prison in Florence, Arizona, all without ever being notified of the charges against him, and pursuant to a truly insane effort to imprison him during deportation proceedings in Arizona when his only wish was to go home immediately to Canada. A "Notice to Appear" is the legal document DHS uses for explaining why someone is being placed in deportation proceedings. It is supposed to include the respondent's signature verifying receipt of this document. Instead of Mr. Danard's signature, Larry Allen, a Customs and Border Patrol (CBP) officer, wrote above the signature line "Refused," an assertion inconsistent not only with Mr. Danard's detailed narrative of making repeated inquiries of ICE officers as to why he was being held, but also inconsistent with the document itself. Officer Allen did not even bother to fill out the space on the top of the box for the notice that indicates the date. A properly executed attempt to serve a document would at least include the date attempted, even if the document itself were not signed and helps explain why Mr. Danard felt he was being kidnapped. Perhaps one reason the CBP officers did not give Mr. Danard a copy of his charges is that they were based on a fictional narrative of his comings and goings. If the officers followed the law and informed Mr. Danard of their claims against him he would have been able to better defend himself, something that the DHS seemed intent on preventing. Knowledge of these charges also would have assisted Rachel, who was soon in touch with the Canadian consulate in Los Angeles. According to Mr. Danard's charging document, the agent who signed off on Officer Allen's statement that Mr. Danard had refused to sign this paper was Tiffany Throckmorton, the Chief Officer at the Port of Sweetgrass. The November 20, 2008 document charges Mr. Danard with being admitted into the United States at El Paso on November 11 as a B-1 visitor, meaning someone entering the country for doing business, and then claims that he is inadmissible because of the 1984 burglary conviction and therefore subject to being held for deportation proceedings. The fact is that Mr. Danard returned from Mexico via El Paso as a tourist, someone who would be classified for a B-2 visa if these were required of Canadians, which they are not. And, Mr. Danard had demonstrably left the United States from Montana and was attempting to re-enter at Sweetgrass, Montana, as indicated by the fact that the CBP officials required him to complete new paperwork to re-enter the country. "When we attempted to re-enter the States," Mr. Danard explained, "the officer on the US side wanted me to fill out a form inside the building, saying that I had technically left the US and was required to apply for admission again." Aliens who are inadmissible because their NIV has been canceled under section 222(g)(1) of the Act may be offered the opportunity to voluntarily withdraw their application for admission, unless there are other related underlying reasons for proceeding with expedited removal, such as long-term or repeated overstays, or other egregious immigration violations. Border Patrol did have the authority to arrest him and put him through deportation proceedings, but perhaps because the agency policy discourages this, the officers tried to cover-up what actually had occurred and thus manufactured a false arrest. The government's secret filing of immigration charges is part of a pattern of I have observed across the country, notable in immigration court when the adjudicators, who have copies of the Notices to Appear (NTA), tell the respondents that they had refused to sign them, and the respondents spontaneously and indignantly reply that they were never shown these documents. This frequently happens when ICE decides to deport people in jails based only on the fact that the folks imprisoned are foreign-born. The practice results in effective kidnappings in these instances as well, as people believe they are being released from jail or prison and instead find themselves in the back of an unmarked white van heading to a destination unknown to even them, much less their friends and family. Moreover, the Executive Office of Immigration Review's recently announced policy of requiring the dates from the Notices to Appear in order to obtain information about immigration hearings means that respondents and their attorneys are further at the mercy of ICE deportation officers, who can arrange for people to be deported just by not bringing them to the hearings, and the incarcerated respondents or attorneys won't know they've missed them. MORE to come: Immigration Judge terminates proceedings, ICE reserves appeal, DHS common pattern of using detention to extort false confession clearly documented, weeks more of incarceration. In theory he might have qualified, but no sane Canadian would apply for C-1 unless necessary. [They are] mostly for guys who work on cargo ships who fly into LA from Manila, then "transit" from LAX to their ship docked in Long Beach..."
Kidnapped Canadian: "I'm Just Looking for a Way Home"
On April 30, 2010 I received the first of dozens of email messages with the subject heading "Kidnapped Canadian." They were from Rachel and Kenneth Murray Danard (he goes by his middle name), Canadian citizens who reside in Alberta. On occasion I changed the message headings to reflect the specific topic, e.g., "FOIA waiver form," but inevitably it was changed back. After receiving Mr. Danard's alien file from the immigration court and reviewing the hearing recordings, I understood why. What started out as a family vacation to Mexico turned into a nightmarish two months of Arizona prison life. Their documents provide insight not only into Mr. Danard's own case, but shed light on systemic problems that pervade the immigration courts and jails. The moral and legal indignities visited on Mr. Danard include Border Patrol agents arresting him in violation of the policies for arriving tourists, not providing him a copy of his immigration charges, and then lying about this (a federal crime); Department of Homeland Security prosecutors abusing the procedures for filing a Motion to Reopen in order to extort a "win" for the government (Robert Barthlemay was the Florence DHS prosecutor who pursued this); an immigration adjudicator (Bruce Taylor) looking the other way and rubber-stamping the coerced agreement; and, especially upsetting, Immigration and Customs Enforcement Deportation Officers keeping Mr. Danard in confinement for weeks after Mr. Taylor had authorized Mr. Danard's return and a plane ticket home had been procured. In mid-October, 2008 Rachel and Murray, a field machinist, flew to Mexico for a long-awaited vacation. At some point they encountered these two dogs, then emaciated stray puppies, and decided to rescue them. To save money they decided to return home by car, and bought a used VW. Border Patrol in El Paso waved them through on November 11, and the Danards entered Canada on November 20. However, the car, which was good enough to enter the United States, was not up to Canadian standards. They decided to turn around and sell the car in Montana. That's when their lives changed. Instead of allowing them back into the U.S. after confirming their Canadian citizenship, a U.S. border patrol agent instructed Murray, but not Rachel, to fill out a visa form. "I am convinced that my choice to wear my hair long and never shave led to a type of discrimination others must suffer constantly," Mr. Danard told me later. In filling out the visa form he honestly admitted to a 1984 burglary conviction, a crime that occurred when he was 17. This could possibly be construed as a Crime Involving Moral Turpitude, and thus grounds for inadmissibility (although an immigration adjudicator later ruled that absent government evidence to the contrary this was a "petty offense exception" and hence Mr. Danard was actually admissible). In the event, the Customs procedures advise agents not to arrest Canadians in this circumstance but only to prevent their entry. Instead of turning him around or allowing him in, the Border Patrol agents at Sweetgrass Montana, including Officer Larry Allen, arranged for him to be arrested and sent to an immigration jail. Rachel described a wrenching scene of her being pushed out of the Montana office with the puppies, and watching her husband being kidnapped, sent first to solitary confinement in a local jail and then to a private prison in Florence, Arizona, where he was held through the Christmas holidays and not released until January 20, 2009.